After 3 or 4 hours of A3 Problem Solving today, I kinda started tiring. I decided that a nice cold coffee drink from Starbucks might get me re-energized. I drove to the Starbucks around the corner from the site and rolled into the drive-thru. There was an SUV in front of me and the girl was talking on the phone instead of ordering. It sounded like she was trying to take an order from a friend over the phone but she didn't have the full order. After a couple minutes she eventually hung up and ordered her drink. Somewhere between the window and the ordering kiosk, she must have gotten a call back from her friend because she asked for four additional frozen drinks at the window. So I sat behind her waiting for the barista to fill her order. When she finally sped away with her drinks in hand 15 minutes later, I pulled up to the window. I had my Starbucks gift card ready to pay with but the teller instead handed me a coupon along with my drink. He then apologized for the wait and explained that the girl ahead of me placed extra orders at the window. On the coupon itself was written an apology for the slow service. I think there is a lesson to be learned here from my experience today at Starbucks. 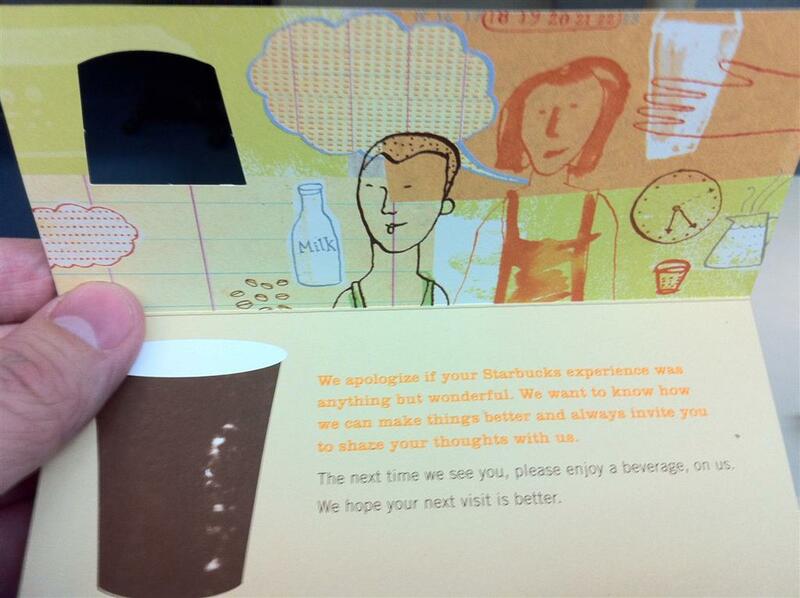 To improve customer satisfaction, Starbucks has created Standard Work for the abnormal. They recognize that no matter how 'lean' they make their business, that "stuff" happens. Coffee machines break down, customers drop in surprise orders, drinks get spilled... the list goes on. Starbucks has not only acknowledged that these things happen - they have actually trained their employees on what to do in case "stuff" happens. Instead of walking away annoyed by the delayed service, I walked away happy and pleasantly surprised. In manufacturing, I don't think we create enough standard work for the abnormal. We know that despite our Lean systems, disruptions are going to occur in our value streams and business processes. What do we do when those disruptions happen? In most cases, we just try to fight the fire whenever the bomb goes off. Processes and systems that are prone to these types of problems should have clearly defined standard work on what to do in case problems arise. Where have you seen well-defined standard work for the abnormal, either at work or elsewhere? I like it when companies empower their employees to solve business problems on the spot. One example is Ritz-Carlton - an employee can spend up to $2,000 to resolve a customer issue on the spot.